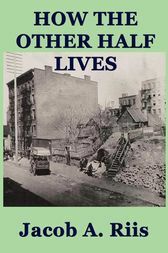 How the Other Half Lives was a pioneering work of photojournalism by Jacob Riis, documenting the squalid living conditions in New York City slums in the 1880s. It served as a basis for future muckraking journalism by exposing the slums to New York City's upper and middle class. How The Other Half Lives quickly became a landmark in the annals of social reform. Riis documented the filth, disease, exploitation, and overcrowding that characterized the experience of more than one million immigrants. He helped push tenement reform to the front of New York's political agenda, and prompted then-Police Commissioner Theodore Roosevelt to close down the police-run poor houses. Roosevelt later called Riis "the most useful citizen of New York". Riis's idea inspired Jack London to write a similar exposé on London's East End, called People of the Abyss.